Wait! Haven’t you just been there?! Is it THAT good there?! Let me explain. Trent and kids were keen to come camping for a couple of days and meet us somewhere, but we weren’t sure where to go. They wanted to get out of Sydney – pretty much anywhere, and we were ready to start heading back closer to Sydney, but not all the way just yet. 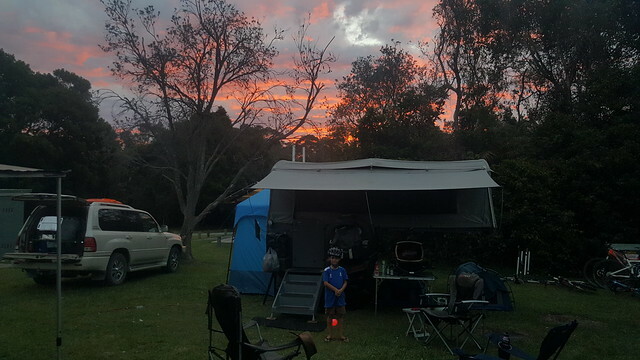 After throwing up a few options, we thought it could be good to head back, but to camp around the corner at Kylie’s Beach Campground, where we could walk through to the beach and spend some time there. However when Trent arrived it was much busier than when we checked it out only a few days earlier, so we suggested he check out Indian Head. Surprisingly it was very quiet, so the decision was made to stop there for another couple of nights. Oh look, Lucas with a helmet on! The plan was similar to our previous few nights. Relax a bit, take the kids for a swim at Lake Cathie, look around Laurieton and really not do much at all. And it was HOT. The first night was very hot – the hottest we’d ever spent camping. I don’t think it dropped much below 30 degrees all night. The fan was getting a workout – we were very grateful to have it! We all struggled for sleep that night. Fortunately the next day wasn’t quite so bad and we were able to have a relatively relaxing day without struggling too much with the heat. As planned we headed over to Lake Cathie where the kids had a quick swim before we grabbed some pies for lunch and came back for a relaxing afternoon at the camp site, where we were treated to a pretty nice sunset. A cooler evening meant that we all slept a little more soundly than previously before waking up fairly early to get our packing done before the heat of the next day set in. Another 2 fun days done – Trent and kids were heading home, while we were off to find the location of our next adventure!